Agra Tour takes you to a sightseeing tour of Agra, the city of the Taj Mahal. Find more on tours to Agra, India. Agra has a number of monuments ranging from the world known structures such as Taj Mahal, Agra Fort and Fatehpur Sikri complex to the lesser known tombs such as Sikandra, Mariam's tomb, Itmad-ud-daulah's tomb and Chini ka Rauza to the ones that are not even known to the locals and their remnants lie helter-skelter and no attention being paid to them. Ram Bagh and Swami Bagh Temple at Dayal Bagh, may not be so famous but have an indelible impression in the hearts of the natives of the city with their own history to boast of. The first Mughal gardens laid by Babur in 1558, half a km from Chini Ka Rauza, were planned carefully in Persian style. They were then named as Bagh-i-Gul Afshan. Later, Jehangir renovated them and named them as Bagh-i-Nur Afshan. Neglected for centuries, these gardens have now turned into wilderness and are known as Ram Bagh. Set to the south of Sarai of Nur Jehan, Babur introduced three-terraced garden here for the first time. The river-drawn water was made to look like a spring, as it artificially descended from one terrace to another through a network of canals, tanks and water chutes that had stairs on both sides ended in a red sandstone pond. The gardens were beautified using 'Chhatris', platforms, pathways and a conglomeration of plants that were cultivated in a landscaped manner. Jehangir had also built two beautiful suites on the two sides of the main terrace and a Mahtab or island platform in the centre, which was connected with the main water system. 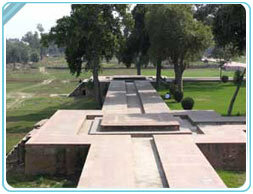 Ram Bagh symbolizes the erstwhile Mughal pleasure garden that hasn't aged gracefully unlike other legacies of that time. Swami Bagh Temple at Dayal Bagh is 10 km to the north of Agra. Started in 1904, it is still under construction even after 100 years! The white marble Samadhi of the Radha Swami, the founder of a unique religion that seeks to being all religions under one umbrella and preaches unity of mankind, the construction of this temple is not expected to be completed until sometime next century. If you want to witness the Pietra Dura inlaid marble work, you must visit the temple and walk to its sides to see the artisans at work. The aim of this structure is to build a temple for Hindus, a church for Christians, a gurudwara for Sikhs and a mosque for Muslims, each on a separate floor, in the same building, to symbolize brotherhood and unity in mankind. The artistic work here is wonderful and has an outstanding visual appeal. However, locals believe that perfect harmony between all the religions at once is impossible, so the building symbolizing it would never be complete and will be damaged anytime, it is close to being complete. Apart from Agra, you can extend your trip to cover the famous golden triangle circle, and explore Jaipur and Delhi too.